Projections of greater interannual and intrannual climate variability, including increasing temperatures, longer and more intense drought periods, and more extreme precipitation events, present growing challenges for agricultural production in the Southern Plains of the USA. We assess agricultural vulnerabilities within this region to support identification and development of adaptation strategies at regional to local scales, where many management decisions are made. Exposure to the synergistic effects of warming, such as fewer and more intense precipitation events and greater overall weather variability, will uniquely affect rain-fed and irrigated cropping, high-value specialty crops, extensive and intensive livestock production, and forestry. Although the sensitivities of various agricultural sectors to climatic stressors can be difficult to identify at regional scales, we summarize that crops irrigated from the Ogallala aquifer possess a high sensitivity; rangeland beef cattle production a low sensitivity; and rain-fed crops, forestry, and specialty crops intermediate sensitivities. Numerous adaptation strategies have been identified, including drought contingency planning, increased soil health, improved forecasts and associated decision support tools, and implementation of policies and financial instruments for risk management. However, the extent to which these strategies are adopted is variable and influenced by both biophysical and socioeconomic considerations. Inadequate local- and regional-scale climate risk and resilience information suggests that climate vulnerability research and climate adaptation approaches need to include bottom-up approaches such as learning networks and peer-to-peer communication. 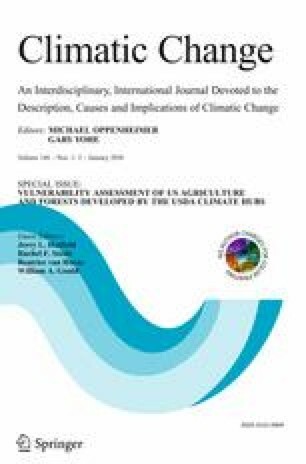 This article is part of a Special Issue on “Vulnerability Assessment of US Agriculture and Forests developed by the USDA Climate Hubs” edited by Jerry L. Hatfield, Rachel Steele, Beatrice van Horne, and William Gould. Climate is a key driver for all ecological and economic systems; therefore, climate change introduces additional uncertainty and vulnerability into these systems (IPCC 2014). Agricultural vulnerability to climate change is well documented at global and national scales (e.g., Walthall et al. 2012; Hatfield et al. 2011; Izaurralde et al. 2011; Lal 2016; Porter et al. 2014). However, it is essential to elucidate vulnerabilities in a way that helps identify adaptation strategies at regional to local scales where management decisions are made. The objective of this assessment is to identify key vulnerabilities of agriculture to climate change in context of the Southern Plains region of the USA, taking a “bottom-up” approach (Noble et al. 2014), whereby practical and efficient adaptation strategies for specific key production systems are proposed. Additionally, this analysis focusing on vulnerability of key agricultural sectors, such as rain-fed and irrigated cropping, high-value specialty crops, extensive and intensive livestock systems, and forestry, may provide a useful framework to assess vulnerability in similar agro-ecoregions of the world. The Southern Plains is primarily characterized by grassland, cropland, and forest land (US Geological Survey (USGS) 2011). In 2012, the regional value of agricultural activity exceeded $59 billion (National Agricultural Statistics Service (NASS) 2014), with livestock accounting for about 58% of the total. Commodities that exceeded $1 billion across the region (Kansas, Oklahoma, Texas) include wheat, corn, horticultural crops, cotton, hay and forages, sorghum, soybean, beef cattle, poultry and eggs, dairy, and swine (Table 1). Forests occupy a smaller land area, but still account for 27 million acres and support numerous ecosystem services both internal and external to the region. Agriculture in the Southern Plains is water limited, with average evaporation exceeding average precipitation in each month of the year (Stewart and Steiner 1990). Even the humid eastern portion of this region experiences regular drought that impacts agricultural systems, streamflow, and reservoir recharge. Many Southern Plains soils have been degraded as characterized by erosion and loss of soil organic matter. Additionally, many cropping systems expose bare soils to intense precipitation events and potential erosion. High runoff results in low water use efficiency of rain-fed cropping and grazing systems and contributes to water quality concerns. The Ogallala aquifer supports irrigated crops in western Kansas and the panhandles of Oklahoma and Texas, but demands have exceeded recharge rates, leading to depletion of the aquifer (McGuire 2011). Surface-water irrigation is also vital to the region’s agriculture, including in the Rio Grande valley, which supports major vegetable and citrus production. Projections for a warming and drying climate with more extreme weather events will increase vulnerability of agriculture in the Southern Plains (Steiner et al. 2015). Water-related challenges will be further complicated by differing water policies among the three states, across Tribal governments, and among different water conservation districts in Kansas and Texas (Peck 2007). Vulnerability assessments are well-established frameworks that have been adopted by the Intergovernmental Panel on Climate Change (IPCC 2014) to evaluate impacts of climate change (Noble et al. 2014). Vulnerability describes the degree to which a system is likely to experience harm due to exposure to hazards (i.e., disturbance or stressor) (IPCC 2014) and is comprised of interrelated components: exposure, sensitivity, and adaptive capacity (Adger 2006). Vulnerability of agricultural enterprises to climate change is determined by interacting social and ecological variables, including the extent to which climate change occurs; the exposure and sensitivity of a particular system to climatic stressors; and the adaptive capacity of systems, institutions, humans, and other organisms to adjust to potential damage, take advantage of opportunities, or respond to consequences (IPCC 2014). Vulnerability assessments simultaneously address these three components and their interactions (Fig. 1). It is critical that vulnerability assessments look beyond climate exposure and economic sensitivity in order to emphasize opportunities to develop adaptive capacity, implement adaptation practices (Joyce et al. 2013), and minimize overreliance on short-term responses (Nelson et al. 2010). Exposure occurs when particular agricultural enterprise is active during the period when a climate stressor is present (Anandhi et al. 2016). Regional temperatures are projected to rise, with up to 30 additional days annually of temperatures above 95 °F (Kunkel et al. 2013a). Parts of the region may experience temperatures exceeding 100 °F up to 60 days annually by 2065. Prolonged periods of high temperatures in the Southern Plains have previously coincided with drought, such as in Texas in 2011 (Hoerling et al. 2013). Projected increases in maximum temperatures will intensify evaporative demand and may increase the risk of significant wildfire events. Minimum temperatures will be elevated (Shafer et al. 2014), increasing the number of heating degree days each year and extending the freeze-free season by up to 30 days (Kunkel et al. 2013a). While the extended growing season could benefit some regions, the actual number of growing days will likely decrease when water deficits are considered (Mora et al. 2013). Projected changes in regional precipitation are more complex and less certain, with climate model simulations showing a range of potential outcomes into the middle and late twenty-first century. Large parts of Oklahoma and Texas are projected to experience longer droughts, with the number of consecutive dry days increasing by up to 5 days (Shafer et al. 2014). As a result, regional droughts—particularly “flash droughts” (Otkin et al. 2016)—may increase in number and intensity. When precipitation does occur, it is likely to be more intense, with a 10–15% increase in maximum 1-day precipitation totals across the region by 2065 (Shafer et al. 2014). Heavier downpours will present additional management challenges due to flash flooding and increased soil erosion (Ojima et al. 2015). The frequency of precipitation greater than 2 in. may increase markedly in Kansas and Oklahoma, but decrease in central and southern Texas (Kunkel et al. 2013b). Warmer temperatures will likely reduce the number and intensity of snow events, particularly in southern portions of the region. Although the concept of exposure is straightforward, there is no widely accepted method for relating indices of climate stressors to the magnitude of exposure for various agricultural enterprises. Anandhi et al. (2016) illustrated a framework for quantifying exposure using a number of climate indices that impact cropping systems of Kansas. Given that precise projections of exposure are currently not possible, multiple adaptation strategies and options are needed to address diverse needs of managers and enterprises (Briske et al. 2015). The sensitivity of plant and animal species to climatic stressors changes with phases of the life cycle. A plant may be mildly sensitive to high-temperature stress during vegetative growth, but highly sensitive to high temperature during reproductive growth. Animals may exhibit minimal sensitivity to water stress during periods with moderate temperatures, but be highly sensitive to limited water during periods of high-temperature stress. Sensitivity of agricultural enterprises is determined by unique exposures to climate stress, sensitivity of specific production systems to these stressors, and the ability of managers to implement adaptation strategies in a timely manner. Limited enterprise diversity and flexibility are often associated with high sensitivity. High sensitivity may originate from multiple causes, including limited property size and financial capital and insufficient strategic skills and environmental awareness (Joyce et al. 2013; Noble et al. 2014). Many of these causes are associated with low adaptive capacity as discussed below. Adaptation in human systems is the process of moderating or avoiding harm or exploiting beneficial opportunities by adjusting to actual or expected climate change. Key components of adaptive capacity include access to economic resources, technical options, and information; management skills; and existence of effective institutions and policies (Noble et al. 2014; Howden et al. 2007; Engle 2011). Developing capacity to implement strategies that avoid stress or reduce system sensitivity can minimize vulnerability. Knowledge of climate change is under-utilized in adaptation, because procedures for incorporating climate information into decision making have not been adequately developed (Marshall 2010; Joyce et al. 2013). This has contributed to a gap between the current state of the system and a system that could minimize adverse impacts of climate change (Noble et al. 2014). This condition is generally described as an adaptation “deficit” or as a “drought trap” in rangeland livestock systems (Joyce et al. 2013). The consequences of adaptive management may modify prevailing conditions and subsequent adaptation options (Fazey et al. 2010). This emphasizes flexibility as a central feature of enterprises that adapt successfully to climate change (Pelling 2011). Adaptive capacity is highly diverse among agricultural producers in terms of their ability to plan, recognize, and manage risk, and to adopt and implement adaptation strategies (Marshall 2010; Briske et al. 2015). Therefore, an array of flexible and cost-effective adaptation strategies are needed that can address the varied sensitivities and adaptive capacities within agricultural systems. Policies, strategies, and incentives designed to support climate adaptation will need to consider existing adaptive capacity of individuals or groups and the region-specific climatic impacts that are anticipated (Briske et al. 2015). Crops are exposed to a wide range of intraannual and interannual climate stressors to which they are highly sensitive, both independently and in concert. The dominant rain-fed crop, winter wheat, is a cool season crop vulnerable to drought, extreme precipitation, increasing temperatures, and changes in seasonality. Establishment of winter wheat is also sensitive to drought, which can reduce fall forage production for livestock. Tillage following wheat harvest can expose the soils to intense rainfall events during the spring and summer months. Warming temperatures can accelerate phenologic development of winter wheat, leaving it susceptible to late frosts after head emergence. Additionally, warm spring temperatures, when combined with dry conditions, can shorten the grain-filling period and reduce wheat yields. In a global assessment, Liu et al. (2016) found that for each 1 °C temperature increase, wheat yield is projected to decrease by 4.1–6.4%, with the greatest decreases expected in the warmest regions. Vocke and Ali (2013) reported that, due to these multiple climate stresses, Texas and Oklahoma have had lower and more variable yields of hard red winter wheat than the rest of USA. Additionally, use of wheat for forage as well as a grain crop, coupled with frequent drought, resulted in a substantially lower ratio of harvested to planted acreage in the Southern Plains compared to the rest of the nation. Rain-fed summer crops are highly sensitive to high temperatures, drought, and extreme rainfall events that can result in erosion and runoff, soil crusting, and physical crop damage from hail. Corn and other feed crops are the primary irrigated crops in Kansas, Oklahoma, and the Texas panhandle, while irrigated cotton dominates further south (Ojima et al. 2015). The region also supports a bioenergy industry, and the grain crop-energy-feedlot sectors are tightly linked. Irrigation reduces exposure to drought from the perspective of crop productivity, but drought and high temperatures increase irrigation requirement and therefore production cost. Additionally, increased pumping during drought exacerbates the long-term depletion of regional groundwater supplies, which has wide-ranging impacts on the region’s social, economic, and ecological systems (Wang et al. 2011). Horticultural crops including sod, tree crops, vegetables, and other specialty crops occupy relatively small areas of land in the Southern Plains, but provide high economic returns and employment. Because of the high capital investment as well as cost of establishing perennial and tree crops, these systems are particularly sensitive to severe weather such as hail, high winds, ice events, and tornados. Specialty crops are often sensitive to high and low temperatures, which can impact quality as well as quantity of production and reduce market price. All phases of beef cattle production—cow/calf, stocker grazing, and finishing—are regionally important, comprising up to 68% of agricultural production value in parts of the Southern Plains (McBride and Mathews 2011). Extensive grazing systems are based on a diversified land use that includes native grasslands, a variety of perennial pastures, and annual forage crops. Drought and rising temperatures are primary climate concerns for beef cattle production, affecting forage availability and quality, water supply, and associated heat stress on cattle (Polley et al. 2013; Ojima et al. 2015). Climate stress results in lower forage quantity and quality, and animal intake will be reduced by lower-quality forage, higher temperatures, and more frequent intense heat (CCSP 2008). High temperatures combined with water deprivation can result in livestock losses on rangelands (Kay 1997; Silanikove 2000). Dry springs and ponds during drought require that livestock travel greater distances for water or that additional water sources be provided. Additional travel distances to water affect livestock distribution and the portion of the pasture that is grazed (Kay 1997; Parsons et al. 2003). Livestock concentration near water and in riparian areas may produce adverse effects on soils, plant communities, and forage production and impair water quality. Warming and drying, especially in southern portions of the region, are anticipated to modify plant community composition and vegetative cover, including an increase in woody plant density and cover or die-off of some species during extreme drought (Briske et al. 2015). For example, eastern redcedar (Juniperus virginiana) was the only southern savanna dominant plant species in which neither survival nor aboveground mass was adversely affected by warming and intensified summer drought (Volder et al. 2013). Additionally, the growth of eastern redcedar has increased in response to warming. These results suggest that, due to greater drought tolerance and a positive response to warming, juniper encroachment into grassland is very likely to accelerate in response to climate change (Volder et al. 2013), resulting in reduced forage availability, degraded habitat for a number of wildlife species, and increased human health impacts associated with allergens (Van De Water and Levetin 2001). Substantial decreases in historical stocking density have occurred throughout Texas, with the sharpest decline beginning during the mid-twentieth century (Wilcox et al. 2012). The extent of reduction has varied, but approached 75% in the Trans-Pecos and Edwards Plateau regions, with woody plant encroachment likely contributing to these declines. An increasing occurrence of climatic extremes, specifically successive wet and dry seasons or years, will likely increase frequency and extent of wildfires in grasslands and necessitate greater attention to fuel management and safeguards to human life and property (Polley et al. 2013). Beef cattle feedlots, swine, and dairy operations are largely situated in semi-arid western portions of the region and depend on water supplied by the Ogallala aquifer. Energy requirements and costs along with animal health and productivity are sensitive to high-temperature exposure in these sectors. Heat stress can be fatal for cattle in feedlots, especially for those fed large quantities of high-quality feeds (Hahn 1997; Howden et al. 2007). Dairy production is also reduced by high-temperature stress (Key et al. 2014). Poultry production is important in eastern Oklahoma and Texas. This industry interfaces with beef cattle production because poultry litter is commonly applied to pastures as a nutrient source (Waldrip et al. 2015). In some cases, over-fertilization has led to increased nutrient runoff from fields, which is exacerbated by intensification of some precipitation events. This has resulted in nutrient enrichment of watersheds and has caused cross-state conflict associated with water quality in water supply and recreation associated with reservoirs and scenic rivers (Layden 2014). Operating costs and poultry health are sensitive to high-temperature extremes. Forest species in the Southern Plains are generally at the margins of their distribution, and are therefore more sensitive to climatic change and extreme events than more centrally distributed forests. For example, the 2011 drought killed more than 300 million rural trees across Texas (Moore et al. 2016). While predictions of future precipitation vary among different climate models, most agree that climate change is likely to result in increased temperatures with associated increases in evapotranspiration and water demand (Sun et al. 2008). In turn, increased water use by trees will reduce streamflow, which could negatively affect aquatic habitats and biodiversity regardless of changes in annual precipitation. Newly planted forests are sensitive to drought, exhibit reduced growth rates, and decreased resistance to insects and disease, which may negatively affect wildlife habitat and populations (Dinon et al. 2013). Droughts and high temperatures also pose major fire risks, especially where drought-induced tree mortality has increased fuel loads. Finally, the southern pine beetle (SPB) has long been an episodic problem in eastern Texas, with outbreaks occurring across a range of environmental conditions (McNulty et al. 1998). Ayres and Lombardero (2000) predicted that SPB outbreaks will become more numerous with climate change as a result of longer breeding seasons and potential production of more insect generations each year. Multiple adaptation strategies have been developed to mitigate impacts of intraannual and interannual weather variability on agricultural production, especially for drought management. The challenge for adaptation planning is to select, implement, and effectively manage appropriate adaptation at the appropriate time. Additionally, a better understanding of climate patterns and signals that impact agricultural resource management (Baumhardt et al. 2016; Mauget et al. 2014a, b; Stout and Lee 2003) improved modeling frameworks for evaluation of alternative tactics and strategies (Ahuja et al. 2007), and information-based management tools (Franzen et al. 2016) are needed to provide managers with increased knowledge to inform management decisions. There is increasing appreciation of the critical role that soils can play to reduce system vulnerability to climate change (Paustian et al. 2016; Brown and Herrick 2016). While carbon stock is declining under most croplands, many producers have successfully increased soil organic matter by changing disturbance practices and diversifying and increasing plant growth, leading to improved aggregation, water infiltration and holding capacity, and nutrient cycling (Acosta-Martínez et al. 2014; Jin et al. 2013; Lehman et al. 2015; Mbuthia et al. 2015; Lehman et al. 2015). This reduces vulnerability of landscapes and agricultural systems to intensifying climatic variability. The USDA Soil Health Initiative, in conjunction with conservation districts, university extension, non-profit organizations, and producers, promotes four key principles to rebuild the soil resource: (1) maintain a vegetative soil cover, (2) minimize soil disturbance, (3) promote plant growth throughout the year to feed the soil, and (4) diversify and rotate crops and cover crops to the extent possible. Increasing soil organic matter, structure, and function is one of the most effective ways to reduce vulnerability of crop and livestock systems across all regions, and the need for such adaptive approaches is great in the Southern Plains (Mbuthia et al. 2015). Crops are exposed to both dry and wet conditions during sensitive periods such as the planting season or reproductive growth phases. To reduce impacts of exposure and sensitivity to climate stresses, producers are adopting reduced tillage practices, expanding use of cover crops, diversifying crop rotations, and using new varieties or species, among other technologies. Vitale et al. (2014) reported higher net returns in more diversified cropping systems. However, in drier parts of the region, cover crops may excessively deplete stored soil water needed by the subsequent cash crop (Nielsen et al. 2016). Conservation and farm risk management programs as well as extension and farmer learning networks can increase adaptive capacity and accelerate adoption of appropriate adaptive practices and technologies. Adaptation approaches for irrigated agriculture to address climate change and limited water supply include new crop varieties (Burow et al. 2014a), lower-water-requirement species (Xue et al. 2014), and more efficient irrigation management (Baker et al. 2013; Conaty et al. 2012). Local water management districts, which exist in some areas of the Southern Plains, can help build adaptive capacity of producers and rural communities. Because of high exposure, high sensitivity, and high economic impact of climate stresses, insurance of specialty crops and their associated infrastructures is important to economic viability of these systems. Additionally, improved varieties and cost-effective shelter systems, such as hoop houses, provide adaptive technologies for high-value crops. Ongoing breeding programs for crops need to increase drought, heat, and flooding tolerance in order to account for changing hydrologic and temperature dynamics (Burke and Chen 2015; Wang et al. 2014; Emendack et al. 2014). New crop species require extensive agronomic research and development of production and marketing infrastructure within a region. Increased adoption of integrated pest management practices will be required for early detection of and flexible responses to increased or new pest pressures (Backoulou et al. 2014; Nansen and Elliott 2016). For forests and tree-based systems, silvicultural management, including thinning and reduction of tree density, can be used to reduce tree mortality and fire risk (Dinon et al. 2013), but may need to become more frequent and aggressive in response to climate change. This assessment primarily emphasizes “within ranch gate” strategies, and does not address broader issues of livestock transportation, meat processing, and cost and availability of water and energy for these enterprises. Adaptive strategies for extensive livestock production involve changes in grazing management, livestock breeds or species, pest management, and enterprise structure, and even geographic re-location of livestock production systems to contend with impacts of climate change in the region (Table 3). These strategies vary greatly in their extent of modification, timing of implementation, specificity of impact, and potential for success or failure (Briske et al. 2015). Adaptive capacity of enterprise managers—which is often overlooked—is as important to effective adaptation planning as is the intensity and duration of climatic variability. Some adaptation strategies require substantial modification of production enterprises, and many managers may need to develop additional skills and may require access to financial capital and technical support to implement them. The projection of climate conditions that have not previously been experienced by the agricultural sector in the Southern Plains underscores the need for development and experimentation with diverse adaptation strategies. The variety and combinations of livestock adaptations to increasing climatic variability have been organized in multiple ways (Noble et al. 2014) and can be characterized using three broad categories—human, enterprise, and social—as described by Joyce and others (2013). The human category addresses climate change awareness, risk tolerance or aversion, emotional flexibility, and capacity for innovation. These attributes are not well quantified for regional agricultural enterprise managers, but they are critical to both development and implementation of adaptations (Marshall 2010). Enterprise adaptations primarily emphasize flexibility of feed sources and adjustment of livestock herd size and composition to match forage supply with demand. Specific adaptations include reserve forage strategies, livestock supplementation to offset reductions in forage quality, combined stocker and cow-calf herds, and integrated livestock-cropping systems (Howden et al. 2007; Joyce 2013). Heat stress maps and alerts provide producers with information that is useful for mitigating animal stress during heat waves (Brown-Brandl et al. 2005; Eigenberg et al. 2005). Social adaptations are those that extend beyond the enterprise to influence both human and enterprise adaptations described above and include learning networks, social organizations supporting enterprise flexibility, and policies that incentivize development and implementation of adaptation strategies. Conservative stocking rates have long been recognized as a viable strategy to maintain economic viability and ecological integrity of grazing lands. However, projections for increasing climatic variability suggest that flexible stocking strategies may require greater consideration. Stockers can be used to supplement the base cow herd to harvest additional forage production in wet years, and they provide an effective way to reduce animal numbers in dry years. Flexible grazing management based on combined cow-calf and yearling operations can produce greater economic returns than a set conservative strategy (Torell et al. 2010; O’Reagain et al. 2011). However, this adaptation introduces greater enterprise complexity and requires additional labor, buyers and sellers for stocker animals, and financial commitments that exceed the adaptive capacity of some managers in the absence of technical and financial support. Alternative livestock species represent another potential adaptation to warming climates. It has been recognized that Bos indicus cattle (e.g., Brahmans) are more tolerant to heat stress than Bos taurus breeds (English and Continental) (Hoffmann 2010; O’Neill et al. 2010). An increase in Brahman and Brangus relative to Angus cattle breeds in hotter regions of Texas suggests that managers have recognized the value of this adaptation (Zhang et al. 2013). Smaller ruminant livestock, e.g., sheep and goats, are more heat tolerant, require less water, and can consume a greater diversity of plant species than cattle and may be better suited to future climates in the Southern Plains (Polley et al. 2013). Increasing climatic variability will increase management uncertainty throughout the agricultural sector. Intraannual variability may pose an even greater challenge than interannual variability because of limited capacity to minimize these rapidly occurring risks. Economic viability may be more sensitive to increased climatic variability than agricultural production (Thamo et al. 2017), because increasing costs of production may reduce profitability even in cases where long-term production potential is maintained. Additionally, regional droughts can cause market drops, as when large numbers of livestock are sent to market in response to regional forage limitations. Similarly, bumper crops during wet years can cause drops in regional market prices. Irrigated agriculture faces increasing challenges, particularly in the Ogallala aquifer region, where it is projected that pumping costs will limit agricultural use by about 2030 (Wang et al. 2011). Growing water use by the energy sector as well as increasing municipal demand will further compete with agricultural requirements. Rangeland beef cattle production may more effectively reduce agricultural sensitivity to climatic impacts compared to cropland beef cattle production (Weindl et al. 2015). Diverse perennial grass species possess greater drought resistance and responsiveness to elevated CO2 than annual crops and are less dependent upon irrigation, fertilizer, and other annual inputs. Shifts from crop monocultures toward diversified crop-livestock systems may have potential resource- and cost-efficiency advantages based on strong synergies among systems and diversified income sources (Weindl et al. 2015). Although multiple strategies are available for reducing exposure and sensitivity and expanding adaptive capacity, they are frequently not adopted, creating adaptation deficits in agricultural systems (Marshall 2010; Noble et al. 2014). Top-down approaches to climate adaptation need to be effectively balanced with bottom-up approaches such as learning networks and peer-to-peer support for particular commodities that address both biophysical and socioeconomic considerations at local and regional scales (Noble et al. 2014). Climate adaptation requires approaches that address biophysical and socioeconomic considerations at regional and local scales, in addition to those already addressing these considerations at national and international scales. As the agricultural community becomes more aware of climate change, they will need new information and technologies to reduce vulnerability of their production systems. The Southern Plains region currently has a strong network of extension and USDA programs to address evolving needs of agriculture. Recently, these resources have been strengthened and expanded through establishment of the USDA Regional Climate Hubs, which were designed to enhance awareness of and access to programs and services within USDA, facilitate regional partnerships, organize training and learning events, and foster producer networks and peer learning to reduce agricultural vulnerability.